I often serve this dish as part of a spread of salads and vegetable dishes, all laid out on pretty platters, which is my favorite formula for summer entertaining. Sometimes I include a meat dish, such as sliced grilled pork tenderloin, but usually the meal feels festive and complete without it, as long as there is a good variety of vegetables and a grain or bean dish or two. 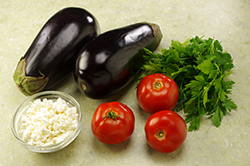 I find that eggplant is “meaty” tasting, so it’s a key part of the balance. You can use smaller Japanese eggplants and split them lengthwise, but I like the nice round medallions that you get from an Italian or globe eggplant. I avoid super-bulbous ones, however, because they usually conceal lots of seeds. If you want to salt your slices, do so, though I don’t see a huge benefit to that extra step. Most fresh eggplants are not that bitter. Use any good-quality feta cheese; I like Valbreso brand, which is made from sheep’s milk in France. Prepare a medium fire in a charcoal or gas grill. The fire is ready when you can comfortably hold your hand, palm-side down, 2 to 3 in/5 to 7.5 cm above the grill rack for 4 seconds. Brush the grill rack so that it is perfectly clean. 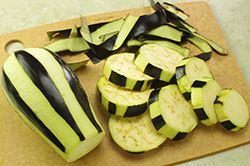 Using a vegetable peeler or a sharp paring knife, peel strips of skin lengthwise off the eggplant to cover it completely in vertical stripes. This eliminates much of the can-be-tough skin but leaves enough to keep your slices intact. Now cut the eggplant crosswise into rounds 1/2 in/12 mm thick. Brush both sides of each slice with the oil and season with salt. 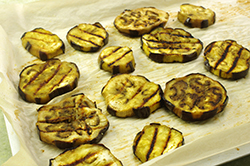 Place the eggplant slices on the grill rack and grill, turning once, until nicely grill marked on both sides and tender, 3 to 4 minutes per side. 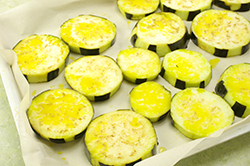 Pile the slices on a plate, cover with aluminum foil, and leave to steam and finish cooking for another 15 minutes. 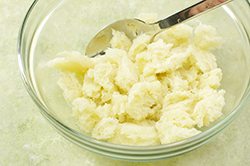 This will create the creamy texture you want. If using the medium tomatoes, core them and then cut into very thin slices. Spread them out on a plate, season lightly with salt, and let some of the juices drain off so they won’t make the eggplant slices soggy, about 10 minutes. If using cherry tomatoes, remove the stems and quarter the tomatoes lengthwise. Put them in a colander or sieve, salt them lightly, and let them drain for about 10 minutes. 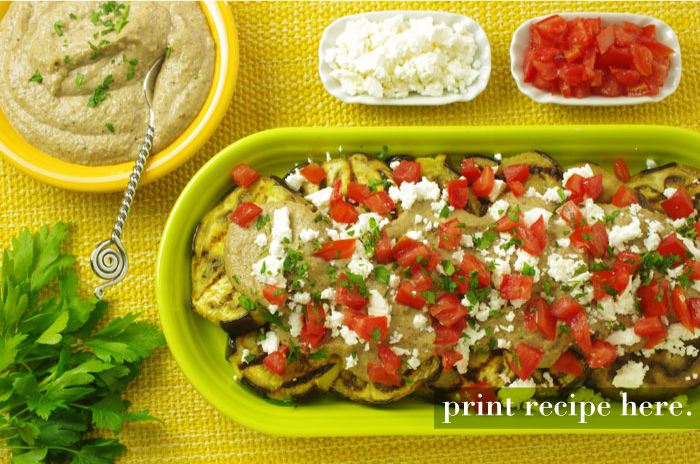 Arrange the eggplant slices on a platter, overlapping them slightly. Spread some of the sauce on each slice, lay a thin tomato slice or a big pinch of tomato pieces on top, then finish with crumbled feta and with a little parsley (if using). Serve cool or at room temperature. The dish can also be assembled up to 1 hour in advance and refrigerated. Let it sit at room temperature to warm up a bit before serving. 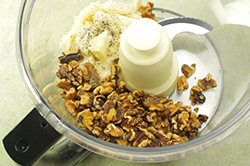 Walnuts play a bigger role in many cuisines, such as those of the Middle East and eastern Europe, than they do in what we call American cuisine. This sauce is a marriage of a traditional Turkish tarator sauce and an Italian sauce called agliata, with some meddling around of my own, of course. It’s amazing how smooth and creamy the walnuts become, and their slight nip of tannins gives a pleasing edge to the sauce. This sauce is particularly good on grilled vegetables, especially asparagus and thick eggplant slices. It also complements grilled fish, or it can be tossed with pasta and then the pasta topped with grilled vegetables. Heat the oven to 325°F/165°C/gas 3. 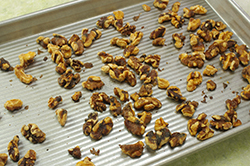 Spread the walnuts in a pie pan or rimmed baking sheet, place in the oven, and toast lightly, 6 to 8 minutes. They should be just fragrant and beginning to take on color but not turning deep brown. Pour onto a plate and let cool. Meanwhile, rip the bread into pieces, put it in a small bowl, add the broth and vinegar, and toss to moisten evenly. Leave to soak for about 15 minutes. 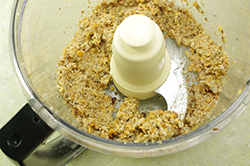 In a food processor, combine the cooled nuts, the bread and any remaining liquid, and the garlic and process until a thick puree forms, stopping as needed to scrap down the sides of the work bowl. 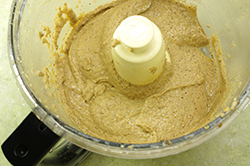 With the motor running, drizzle in the oil to form a creamy emulsion. If the mixture seems a bit thick and gloppy, pulse in a few tablespoons of water. Season generously with salt and pepper and taste and adjust with more vinegar if needed. Serve at room temperature. STORAGE: Refrigerate in an airtight container for up to 2 days. The sauce does not freeze well. 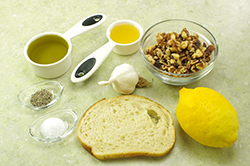 QUICK CHANGE: Add 1/2 cup/55 g sliced yellow onion to the processor with the nuts and bread.